Based on contemporaneous documentation and interviews with policymakers across the globe, FIGHTING FOR DARFUR is the story of what was happening in the corridors of power while Darfur activists were building public pressure from the outside. The Darfur advocacy movement has been called the largest U.S. social movement since the anti-apartheid era, thanks to the involvement of literally thousands of people who transformed themselves into activists. 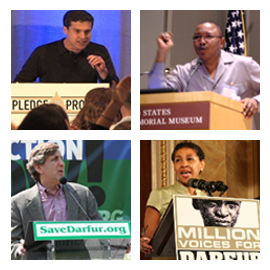 FIGHTING FOR DARFUR follows just four of those people. These four activists are not perfectly representative of the whole, but they each provide a lens into different aspects of the Darfur movement which will be recognizable to anyone who has been part of it.